creativity: a way out of depression? john over at storied mind has taken up the thread of the discussion on creativity that i started a while ago with Psyblog and, creative person that he is, is talking about it in connection with depression. let me add a bit to that discussion. first of all, i’d like to say that if someone put a gun to my head and forced me to label myself, i would say “artist”. if i don’t get to play with language and ideas, if i don’t get to dance once in a while and gorge my eyes on beautiful images – well, i don’t know what would happen because i never let it get to that point. my work as a counsellor, too, is in my eyes an act of creativity. together, my client and i collaborate on seeing their lives as a work of art and on creating experiences, actions, attitudes and thoughts that help them live better lives and through that, ultimately help others around them create more goodness as well. in reading over john’s article, what i was thinking was that at least in some situations, creativity doesn’t so much chase depression away but can help us experience it in a different light. years ago, when i was doing a lot of work in the area of chronic pain, a friend asked me, “so – are you including depression in your research, too?” he saw depression as chronic emotional pain. i think there is a lot of truth in this. and just as we can experience pain in many different ways, perhaps we can experience depression in different ways. for me personally, the worst part of depression is a significant change in e-motion – in my inner movement, as well as in the actions that are influenced by that movement. when in a depression, the decision of whether to wear black or white socks is overwhelming because my decision-making apparatus has slowed down to a tired old snail’s pace. leaving the house, if i manage it, can take two hours because putting on a coat and finding my keys present almost impossible-to-overcome obstacles. fright or flight don’t work anymore – there’s only freeze. the urge to create can be one of the few e-motions, or motivating drives, to get me moving again. that’s where depression can become qualitatively different. the pain is still there but its place inside of me and its colour and texture change. if i follow the creative urge and find words to describe the depression, things start to move, and a bit of momentum builds up. it may not last long, but the depth of the creative experience helps me remember that there was movement, not just way back when, when i wasn’t in that black cloud, but just a few hours ago. that helps me put the depression in perspective, can remind me that depression is an experience, it’s not me, it’s not my master, it’s “just”pain, and i know i am not pain. in those moments, i can sometimes be grateful for the depression for giving me creative impetus. there is something about creating … that draws out a force within me that dissolves depression. what is that? can i package some and pull it off the shelf when i need it? in my experience, creating does not dissolve depression, it changes it for the better, it changes it for the different. what creating helps me “pull off the shelf” is the realization that depression is not my master. This entry was posted in blogs of note, creativity: poetry, art, etc., depression and mental illness and tagged creative people, creativity, depression, pain on June 16, 2008 by isabella mori. isabella – This post has such interesting insights about both creativity and depression. I especially like the variety of activities you see as expressions of the creative mind. Right on! This is not about the handful of geniuses who changed the world with their creative work. This is about the rest of us. I also recognize a lot in your description of depression, and the way writing or another activity can change your experience of those slowed-down miserable periods. But when I’m lucky, writing (in my case) moves me completely out of depression into a different state altogether. I guess I need to work on another post to explore more what is going on at those times. thanks for continuing this conversation, john. it looks like one thing we’re seeing here is that tehre is no one animal that is called depression – the experience is different for all of us. what you say here reminds me that it’s the same for creativity. in a post some time ago, i raised the question, what is an artist?, and there were so many different opinions expressed there. we could/should go even further and talk about “creative people”. that reminds me, i still haven’t read the cultural creatives: how 50 million people are changing the world – have you read it? Depression is made overwhelming by our culture’s lack of true creativity–driving people into material boxes that stun and suffocate. Eric Maisel, PhD, author of The Van Gogh Blues: The Creative Personâ€™s Path Through Depression, addresses some of the meaning and mood issues facing creators. Continued in our interview: Investing meaning in our art. douglas, did you take part in eric maisel’s 10 zen seconds book tour last year? that was a great project, i’m really happy i participated. “meaning” is always a difficult word for me, perhaps because one of my favourite philosophy professors warned me to stay away from that word because it’s so incredibly vague. mattering, on the other hand, is something more substantial (and i guess some people would see mattering as part of meaning). if we feel we leave no trace in this world, if it looks like no-one and nothing is impacted – that is a frightening experience. it’s a funny thing with creation, though. from an “objective” point of view, creation literally equals “leaving traces” – on paper, canvas, clay, wood, etc. it is when we feel these traces don’t matter when we get into trouble. would be interested in hearing what you think about that, john. This is mostly a comment about the image, though I got a lot out of the post too, especially the perspective that creativity helps change how the depression feels and how much control it has rather than dissolving it–that makes a lot of sense and rings true for me. 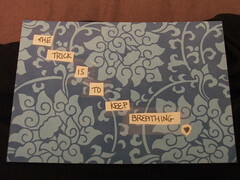 But anyway, I’m in the middle of a book called _The Trick is to Keep Breathing_. Have you encountered it? It’s really interesting especially in terms of how it tells the story (and plays with narrative) of depression/trauma/eatingdisorder–the experiences of a woman going through all those things. @eeabee, thanks for stopping by, always good to hear from you! you know, now that you mention it, i HAVE heard of that book but haven’t read it (yet). i should put it on my list of books to read. “the trick is to keep on …” in a way, that’s about both depression and creativity, too, isn’t it? I have learned that depression is our heart trying to teach us something; our emotions crying out to be heard. It is like an inner cry desperately wanting to be heard. The key is in the journey to discover what that cry is. Medicating the cry away does not work for me. It must be written out, talked out, painted out, danced out… expressed out. It cannot be shut up without being heard. Our hearts crave something bigger than what we have; bigger than what we are. Creativity is only partially the way to get it out. It is one of the keys to the locked door of the dark tunnel of depression. There is light on the other side. There is hope. I have seen it. What one does with their creativity is another key. Does it edify others? Then do it. Does it uplift others? Then do it. Creativity that seeks self gratification and self glorification is only temporarily. Consider a retired multi millionaire who has spent his life chasing after success. He has it all but it’s nothing. It’s meaningless – like chasing after the wind. He’ll die and it will all be gone. Joy and purpose is found in living a life looking outward and upward; not inward. The self-medicating Jackson Pollock did not find it. The womanizing Pablo Picasso did not find it. They both looked in the wrong direction- desperately trying to fill the hole on their own strength; looking inward. The light shone inside them yet, thinking they were letting it out, they were extinguishing it. Did world wide fame bring them happiness? No. I believe we will never cure world wide depression entirely (and, as suggested above, eliminate creativity) because each of us is on a journey. What I love is walking with others on that journey. Standing at the end of the tunnel shining the light for others is the most amazing thing to be a part of. Let your creativity juices flow! Thanks for submitting this post to our blog carnival. We just published the 36th edition of Brain Blogging and your article was featured! Depression and Creativity are almost synonymous with each other. I think creativity helps to bleed some of the depression and can be very cathartic. The list of creative artists who were depressed are so many to name. Earnest Hemingway comes to mind. I think every depressed person needs a creative outlet. I know when I am going through down times in my life then I always feel comfort in some form of creativity. I also think it creates the best form of artistic expression that people can relate with i.e. Picasso’s blue period just to name one. Well it does depend on what you are depressed about. If you directly address the very exact problem causing your depression, that often will do wonders for you. I personally find art, both studying artists and do my own painting myself, a terrific way to occupy yourself and avoid boredom which for me sometimes leads towards grey thoughts. A passion that takes up your time and thoughts is important, but i guess its doesn’t have to be creative necessarily.